None of these news sources reacted in the same way I did: incredulous. This is a reflection of a total lack of understanding of public transportation, especially buses, at the upper levels of policy making in this government. Beyond policy makers, these comments reflect a lack of understanding of public buses on those who do not use them. This is important and disappointing because their insane musings have been re-packaged verbatim into news and thus the sole official viewpoint distributed to the public. What “lean hours”? Though peak hours are undoubtedly characterised by terrible traffic congestion, I doubt that any Delhi commuter would say that traffic moves with ease at any normal travel time. I take a lot of buses in the early afternoon, and I’ve never felt that a bus was not crowded enough. To test this theory, I counted the passengers throughout my daily trip between Pant Nagar and Hamdard Nagar/Sangam Vihar this week on the 445A (orange or cluster bus). I used NextBus Delhi, a mobile application created by Delhi Integrated Multi-Modal Transit System (DIMTS), to learn more about my route. I learned that the trip between Pant Nagar and Hamdard Nagar measures 10.1 kilometres, therefore putting the trip’s cost just past the 10 kilometre threshold, the cost would be Rs. 15 instead of Rs 10. Very clever! The application estimates that my trip should take approximately 34 minutes to travel said 10.1 kilometres, an average speed of 17.8 kilometres per hour. Instead, my afternoon trip took 47 minutes of bus travel time (in addition to walking to and from the bus stops and waiting time). The average bus speed during the trip was 12.9 kilometres/hour. Ask anyone: bus user or Delhi driver: there are no “lean” hours. Delhi traffic is predictable only in its slow speeds. This trip, when a bus trip took significantly longer than the operator’s own estimate, is a proof that Delhi has not made a way for buses to move easily through the cities. Trapped in traffic, buses move along their routes slower, passengers wait longer at stops and inside the bus, and the bus becomes less reliable as a means of punctual transportation for consumers. Providing the road infrastructure for fast travel on buses is a key element to making buses attractive methods of transportation. Perhaps the members of the National Green Tribunal meant not that lean hours are when lower levels of traffic congestion are experienced in Delhi, but when buses are less full. Again, I believe there is no such thing. I boarded the bus on a Wednesday when there were 14 passengers on the bus. A number of passengers inside the bus climbed throughout the route. The seats were all occupied after Paras Cinema, about seven stops later, as the bus drove down Guru Ravi Das Marg, there were 18 people standing. When the bus arrived at its final stop shortly afterward, nearly every seat was still occupied. Various articles that I have read that reported on this topic talked about spectrums of “emptiness” led me to wonder if the non-bus population sees only two types of bus crowds: at capacity or empty. To quote from the NGT statement: “Unfortunately, we also live in Delhi. 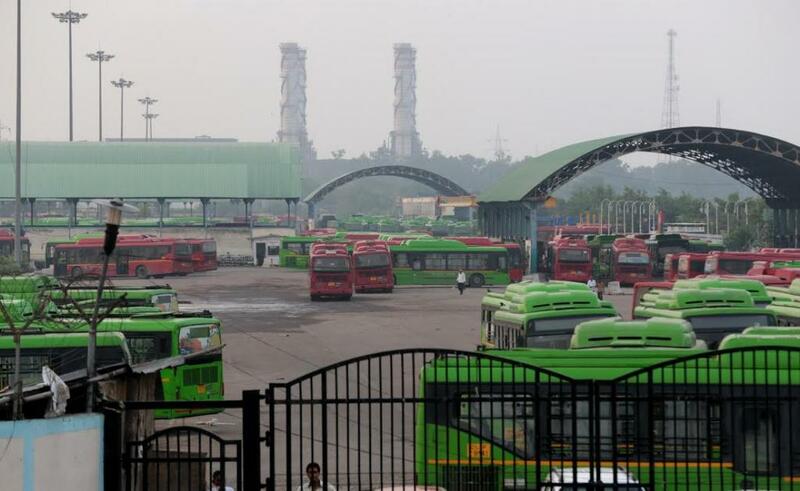 Your huge buses ply empty for at least five hours a day…You are wasting government revenue, creating traffic chaos and causing environmental pollution.” It is absolutely astounding to me that the NGT has made this criticism—that the buses are the cause of environmental pollution by virtue of providing a service? At what point does the NGT feel that a bus is properly stuffed? An orange bus has 39 seats, one of which is nearly always occupied by a conductor. A green or red bus has fewer seats, since the area around the rear door is seat-less, allowing crowds to congregate, or for a wheelchair to be placed. I fear that the stated capacity of a bus, sixty passengers, is confusing. This is not the goal for each bus’s trip; this is the upper limit. Though I boarded the bus during a so-called lean hour (2.40 pm), the bus nearly reached the bus’s capacity of 60 during the 47 minute ride. Is the government categorically unsatisfied anytime that fewer than 50 per cent of passengers are standing? Though to my knowledge this possibility has not been tested, I believe that the NGT panel’s suggestion that the DTC switches to smaller buses during off-peak hours is not a rational suggestion. Of course it practicality is based on the—I believe false—belief that buses are not full enough. Increasing bus service through smaller bus vehicles may be worth investigating in areas more on the borders of Delhi or in areas with less bus traffic or for Metro feeder service. But it seems extremely impractical for buses to switch to smaller vehicles during the day. Interestingly enough, my bus route is through south Delhi, where bus ridership is the lowest in numbers (5.02 lakh daily), among the geographic regions distinguished by the DTC. The NGT has a point that bus maintenance is inadequate. According to official DTC operational data, the number of breakdowns per 10,000 kilometres has increased from 0.67 in 2005-2006 to 5.35 in 2014-2015, with most of the growth in breakdowns coming in the last four years. Though this may be indicative of an aging fleet, such a large number of breakdowns is disruptive to the service. In April 2015, the size of the DTC bus fleet was 4,705 buses, with the majority of buses being non-AC low floor buses. Of these, less than 5,000 buses, the total fleet utilisation was 85.29 per cent. Breakdowns are not only occurring much more frequently than they have in years past, they are occurring very often per vehicle. Breakdown data was not available for the NCR bus service or DIMTS’s cluster buses. Breakdowns are occurring at astoundingly often rates, not just per kilometre, but per bus. I should emphasise that my calculations on breakdowns per bus are done for the total size of the fleet, whereas the utilisation ratios. The NGT sees this as an example of improper maintenance. So tellingly, their collective words are: “Have you ever seen a single bus which does not make horrible noise. Their noise is annoying. If anyone is behind that bus he will get mad within no time.” Behind the bus, as in, the noise of the bus is only an inconvenience to the people not in the bus, outside the bus—what about the people inside the bus? Does the noise not bother them too? Many in Delhi have been pushing for the government to buy new buses. This is not just because the number of buses needed to serve the population is low, but the fleet is ageing. Standard floor buses were supposed to have been completely phased out with the purchase of low-floor buses, but these vehicles still comprise almost a fifth of the DTC bus fleet. Buses are considered “overaged” at the age of eight years. Currently, one in five buses in Delhi is overaged, nearly all of those buses older than 10 years. There is another problem on the horizon; 14 per cent of Delhi’s buses are six to eight years old, indicating that they will be considered overaged very shortly, and that the time to buy new buses is indeed now. And as a personal plea, feel free to tweet me your stories and photos of bus pictures—especially to disprove this crazy “lean hours” idea—at my personal Twitter handle: @GraminSewaKiJai. Great article. After reading those news reports I was convinced that those buses are causing too much pollution along with private vehicles. But I forgot with very high population density and relatively low par capita income, public transport is the only solution for India.